A photo of a welcome visitor. The photo was taken by our grandson in our garden. He was playing Hide and Seek with his sister but could not resist to show us the chameleon so he gave away his hiding place. Spotted on an evening primrose flower outside our kitchen this morning. Welcome or not? Almost missed this one as it blended in quite well. Mike, how has your butterfly count been this year? We haven't seen many at all and not a single swallowtail so far, certainly no caterpillars. Butterfly numbers and variety are low in Rome too this year. Although I have had Swallowtails and Scarce Swallowtails. Seeing your post has prompted me to ask a question that I have wanted to ask for a while. Is it only my Buddlejas that are not attractive to insects are is this a common occurrence in Mediterranean gardens. Only occasionally do insects settle on mine. When they do, they seem happy and gorge themselves. But I'm used to seeing bushes covered in insects in the UK. In my garden there are one or two insects at most while the Salvias and Verbenas nearby are literally buzzing with activity. Regarding Buddlejas and Butterflies David, I have kept a watch on our two Buddlejas and have not seen any butterflies visiting them this year. In fact I have not yet seen any butterflies on our Crithmum maritimum the parsley or the Florence fennel. The past few years I have sown parsley and fennel specifically to cope with the demands of the Swallowtail caterpillars that used to decimate the Crithmum. I had noticed the number of caterpillars on the parsley and fennel increase but this year so far nothing. John and I decided to remove the excess of the parsley to make space for the Peruvian spinach. After having posted recently about not seeing any caterpillars I came across these 2 chaps yesterday munching away on our Crithmum. Nowhere near as many as we normally get but at least it's something. Working in a friend's garden the other day I knocked one of these beautiful caterpillars from a Fennel plant - one of their favourite feeding grounds. I carefully replaced it and later I saw my first Swallowtail of the year and felt well rewarded! While taking photos of the flower on our Crassula perfoliata today this swallowtail landed on the Crithmum growing next to it so I had to get a couple of quick shots before it flew on. Love the last 'photo John - showing real 'attitude'! Hard to say who's the friend here. 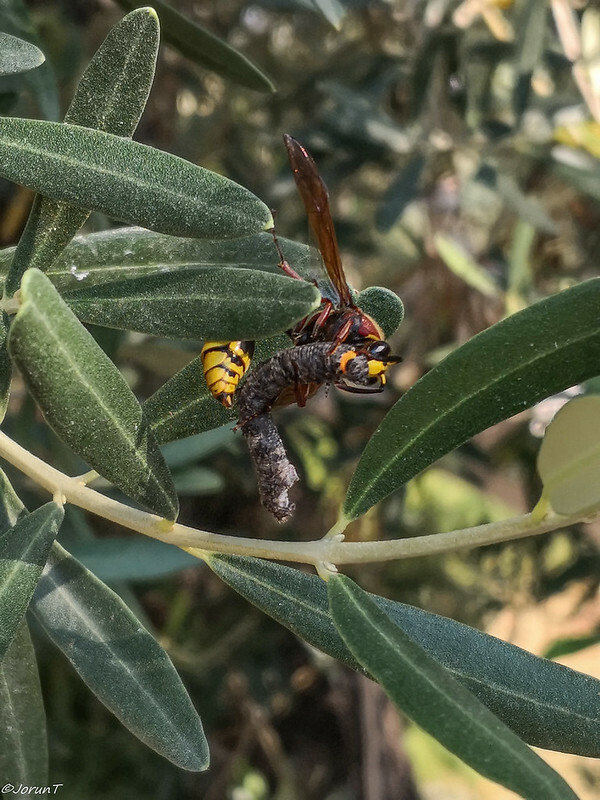 The wasp was seen flying with a larva much bigger than itself, they conveniently landed on an olive branch so that I could get a quick shot with my phone. The larva seemed to be paralyzed by the wasp. On going out early this morning to take advantage of the cooler air before the heat of the day builds up I bumped into, almost literally, this character sitting in the middle of its perfect web. I assume it was waiting for breakfast to arrive. Found this poor chap this evening as I was doing a bit of watering. I believe it's a Black Whip Snake (Dolichophis jugularis) that can grow to 3m in length. They don't take on the black colour until they are around 5/6 years old. They are not poisonous and are therefore welcome visitors as they take rodents, some insects, and even other snakes. Many years ago, before the land around us was built upon as much as it is today, we used to get very large blacks but I haven't seen a big one for a long time now. The secateurs are for comparison.